Jerky Direct was launched in 2004 by Roger Ball, the guy that launched the Golden Valley Natural brand of jerky, as well as Intermountain Natural, a meat processor. Back in 1969, he launched the King B brand of jerky. In 1983, he helped found Melaleuca, a direct sales brand of wellness products. The success of Melaleuca seems to have inspired Ball to extend direct sales into the jerky business. All of Jerky Direct's products are manufactured by Intermountain Natural, the same company that makes meat snacks for Golden Valley Natural, as well as jerky for store brands like Trader Joe's and Whole Foods Market. I've reviewed jerky for all of those brands here on Best Beef Jerky, and it's all largely the same stuff, just different labeling. Though, I haven't had these "beef steak sticks" before. 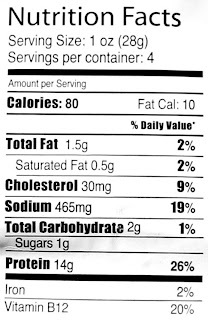 Beef, water, salt, sugar, flavorings, monosodium glutamate, sodium nitrite. The tastes I pick up from the surface of these pieces is a smoky aroma and maybe just a faint bit of sweet. Going into the chewing, I pick up some black pepper taste (probably the result of biting a pepper corn), some natural meat flavors, and some saltiness. Right off the bat, I have to say that of all the jerky I've had from Intermountain Natural, this stuff has the most natural meat flavors of them all. You might argue that these Beef Steak Sticks are not jerky, but I'd argue that I've seen other products marketed as "jerky" in the same size and cut as this. Either way, it's still pieces of dried whole meat. However, this still doesn't have much taste to it, which is on par with everything else I've had from them as well. I'd say the dominant taste of these sticks is the natural meat flavors, which is still not a strong taste, but still strong enough to be enjoyed at a good level. Some of the pieces I bite into release traces of oil or fat, which adds to the meat taste, giving it a "beefier" taste. For being advertised as a peppered variety, I do indeed taste the black pepper, but it probably varies from light to medium in terms of intensity. I tend to taste it in the chewing, and most likely because I'm biting into a pepper corn. The pepper is the second-most dominant taste. The saltiness is also light, probably about the level that I'm most comfortable with. These appear to be cuts of whole meat, sliced into strips of varying between 1 to 6 inches in length, and widths of about 1/2 inch. This is largely a dry jerky, but having a slight bit of moisture. It's somewhat easy to bite off a piece; it might take a little bit of tugging. The chewing is also somewhat easy. It provides a chewing experience that's very much like a real steak, once you've managed to soften it up in your mouth. For the most part, it's a very clean jerky, aside from the bits of pepper that fall off. A couple of the pieces had some significant amounts of fat, but I didn't really find them to detract from the taste, they actually enhanced it. Though if in any greater amount, they might have ruined the taste. Otherwise, I found no pieces of tendon or gristle. 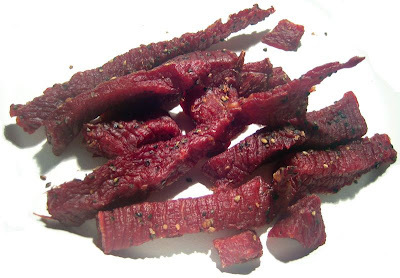 Jerky Direct sells these peppered steak sticks at a price of $12.00 for two 4 ounce bags. That works out to a price of $1.50 per ounce, putting this into the average price range. For general jerky snacking purposes, it has a great value. I found it offer a good amount of taste, though not quite "flavor packed". It's very snackable with its decent amount of natural meat flavors and black pepper taste. I think meat lovers will even find the thick cuts of beef to provide some good satisfaction as well. As a peppered jerky, it has a decent value. I did find a fair amount of black pepper taste; you're just not going to get tons of it. But considering the medium-level pricing at $1.50 per ounce, I'd see it as a decent purchase. If priced any higher, I'd find the snack value to drop significantly. 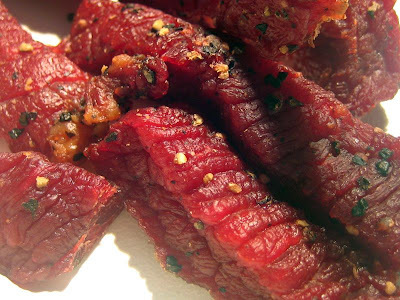 I found these peppered beef steak sticks from Jerky Direct to have a decent amount of natural meat flavors to enjoy, and combine that with its thick chunky cuts, and it really provides a great meat snacking experience. The volume of black pepper seasoning ranges from low to medium on a piece-by-piece basis, but you'll always find enough black pepper to identify in each piece. But aside from that, I don't really taste much more. It's largely a bland jerky with respect to its flavor complexity. I keep wanting to find something else like garlic, or soy sauce, or something, that makes my brain work in conjunction with my tongue to provide an additional layer of appreciation. I think this is probably the best stuff I've had from Intermountain Natural to date. Try a brown ale with this.